Even the most sophisticated global climate models are known known to have significant biases in the way they reconstruct the climate system. Correcting model biases is therefore essential for creating realistic reconstructions of past climate that can be used, for example, to study long-term and large-scale ecological dynamics. Here, we evaluated three widely-used bias correction methods by means of a global dataset of empirical temperature and precipitation records from the last 125,000 years. The surface energy and mass balance of ice sheets strongly depends on surface albedo. Here, using an Earth system model of intermediate complexity, we explore the role played by surface albedo for the simulation of glacial cycles. 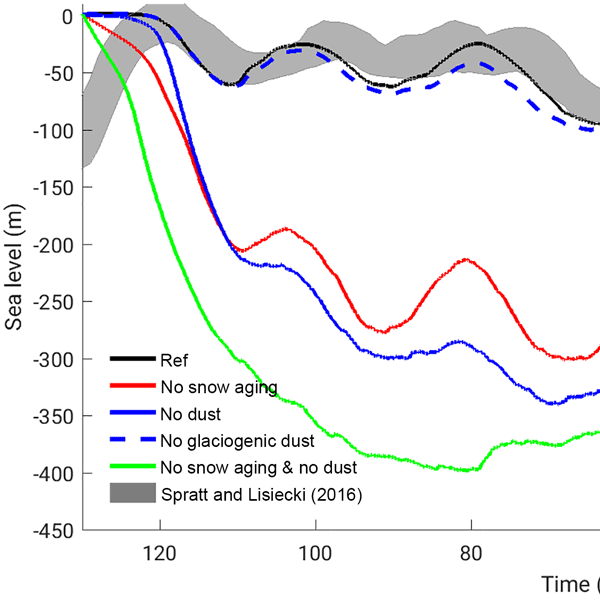 We show that the evolution of the Northern Hemisphere ice sheets over the last glacial cycle is very sensitive to the parameterization of snow grain size and the effect of dust deposition on snow albedo. Submarine melting (SM) has been discussed to potentially trigger the recently observed retreat at outlet glaciers in Greenland. How much it may contribute in terms of future sea level rise (SLR) has not been quantified yet. Under RCP 8.5, the SLR-contribution of 12 outlet glaciers increases by a sevenfold until the year 2100 if submarine melting is accounted for. Thereby both forcing factors of submarine melting, subglacial discharge and ocean temperature, are of equal importance. Transient glacial cycle simulations with an EMIC and the PDD method require smaller melt factors for inception than for termination and larger factors for American than European ice sheets. The PDD online method with standard values simulates a sea level drop of 250 m at the LGM. The PDD online run reproducing the LGM ice volume has deficient ablation for reversing from glacial to interglacial climate, so termination is delayed. The SEB method with dust impact on snow albedo is seen as superior. PALADYN is presented; it is a new comprehensive and computationally efficient land surface–vegetation–carbon cycle model designed to be used in Earth system models of intermediate complexity for long-term simulations and paleoclimate studies. We apply a framework to compare and objectively accept or reject competing melt and run-off process models. We found no acceptable models. Furthermore, increasing model complexity does not guarantee better predictions. The results highlight model selection uncertainty and the need for rigorous frameworks to identify deficiencies in competing models. The application of this approach in the future will help to better quantify model prediction uncertainty and develop improved process models. We show through observations and simulations that cold content, a key part of the snowpack energy budget, develops primarily through new snowfall. 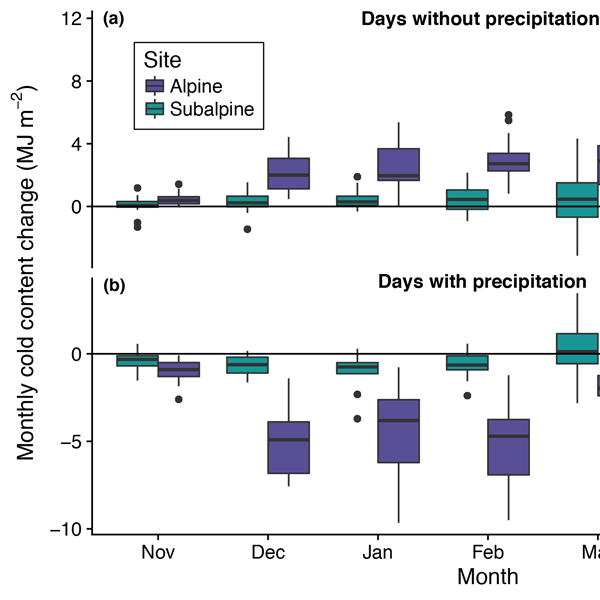 We also note that cold content damps snowmelt rate and timing at sub-seasonal timescales, while seasonal melt onset is controlled by the timing of peak cold content and total spring precipitation. 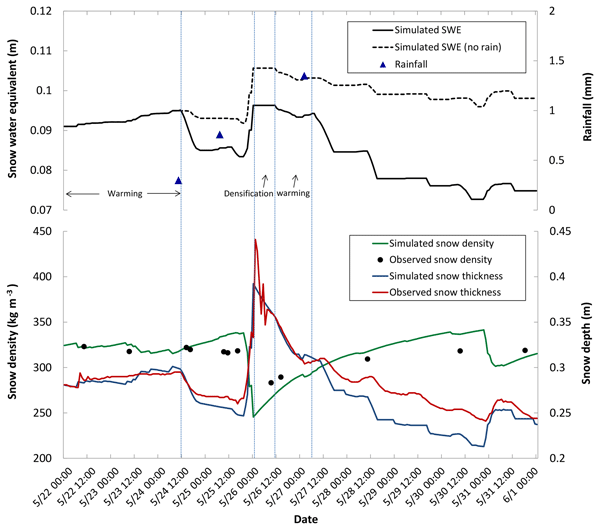 This work has implications for how cold content is represented in snow models and improves our understanding of its effect on snowmelt processes. Idealized model experiments demonstrate that, in addition to a gradual climate change, changing daily to weekly variability of meteorological variables and extreme events will also have an impact on mean annual ground temperature in high-latitude permafrost areas. In fact, results of the land surface model experiments show that the projected increase of variability of meteorological variables leads to cooler permafrost soil in contrast to an otherwise soil warming in response to climate change. Biological growth darkens snow and ice, causing it to melt faster. This is often referred to as bioalbedo . Quantifying bioalbedo has not been achieved because of difficulties in isolating the biological contribution from the optical properties of ice and snow, and from inorganic impurities in field studies. In this paper, we provide a physical model that enables bioalbedo to be quantified from first principles and we use it to guide future field studies. Despite the crucial role of polar regions in the global climate system, the limited availability of observations on the ground hampers a detailed understanding of their energy budget. Here we develop a method to use satellites to fill these observational gaps. We show that by sampling satellite observations in a smart way, coverage is greatly enhanced. We conclude that this method might help improve our understanding of the polar energy budget, and ultimately its effects on the global climate. We identify and correct station-tilt-induced biases in insolation observed by automatic weather stations on the Greenland Ice Sheet. Without tilt correction, only 40 % of clear days have the correct solar noon time (&pm;0.5 h). The largest hourly bias exceeds 20 %. We estimate the tilt angles based on solar geometric relationship between insolation observed on horizontal surfaces and that on tilted surfaces, and produce shortwave radiation and albedo that agree better with independent data sets. Clouds are shown to force fundamental changes in the surface energy and mass balance of Brewster Glacier, New Zealand. Cloudy periods exhibit greater melt due to increased incoming long-wave radiation and higher atmospheric vapour pressure rather than through minimal changes in mean air temperature and wind speed. Surface mass-balance sensitivity to air temperature is enhanced in overcast compared to clear-sky periods due to more frequent melt and a strong precipitation phase to albedo feedback. Our work quantifies the effect of snow/ice cover on Earth's top-of-atmosphere solar energy budget. We used higher resolution MODIS data, combined with microwave retrievals of snow presence and radiative kernels produced from 4 different models for Cryosphere Radiative Effect (CrRE) estimation. We have estimated a global land-based CrRE of about -2.6Wm-2 during 2001-2013, with about 59% of the effect originating from Antarctica. We were also be able to resolve contribution from mountain glaciers. 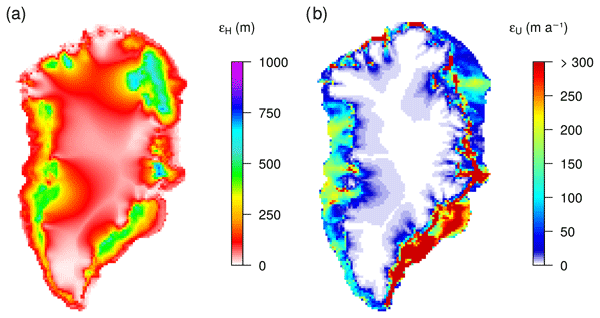 Bougamont, M., Bamber, J., Ridley, J., Gladstone, R., Greuell, W., Hanna, E., Payne, A., and Rutt, I.: Impact of model physics on estimating the surface mass balance of the Greenland ice sheet, Geophys. Res. Lett., 34, L17501, https://doi.org/10.1029/2007GL030700, 2007. 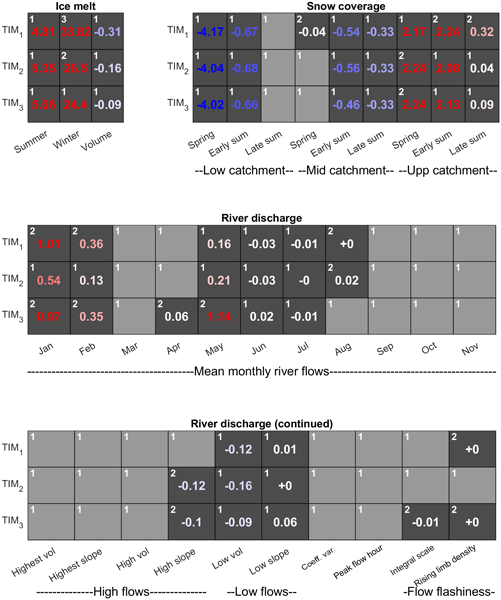 Calov, R., Ganopolski, A., Claussen, M., Petoukhov, V., and Greve, R.: Transient simulation of the last glacial inception, Part I: glacial inception as a bifurcation in the climate system, Clim. Dynam., 24, 545–561, https://doi.org/10.1007/s00382-005-0007-6, 2005. Cuffey, K. and Paterson, W. S. B.: The Physics of Glaciers, Elsevier, 4th edn., 2010. Fettweis, X., Box, J. E., Agosta, C., Amory, C., Kittel, C., Lang, C., van As, D., Machguth, H., and Gallée, H.: Reconstructions of the 1900–2015 Greenland ice sheet surface mass balance using the regional climate MAR model, The Cryosphere, 11, 1015–1033, https://doi.org/10.5194/tc-11-1015-2017, 2017. 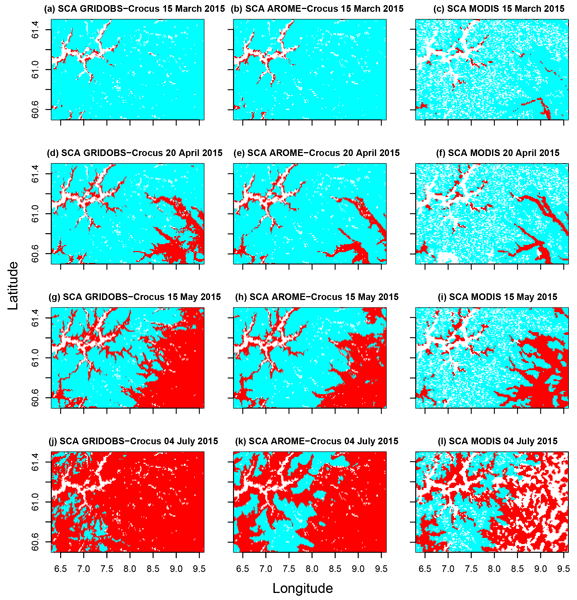 Fitzgerald, P. W., Bamber, J. L., Ridley, J. K., and Rougier, J. C.: Exploration of parametric uncertainty in a surface mass balance model applied to the Greenland ice sheet, J. Geophys. Res., 117, F01021, https://doi.org/10.1029/2011JF002067, 2012. 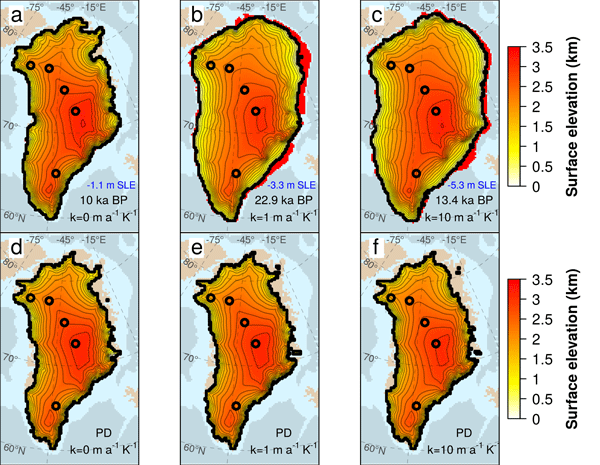 Franco, B., Fettweis, X., and Erpicum, M.: Future projections of the Greenland ice sheet energy balance driving the surface melt, The Cryosphere, 7, 1–18, https://doi.org/10.5194/tc-7-1-2013, 2013. Gill, A. E.: Atmosphere-Ocean Dynamics, International Geophysics Series, Academic Press, New York, Vol. 30, 1982. 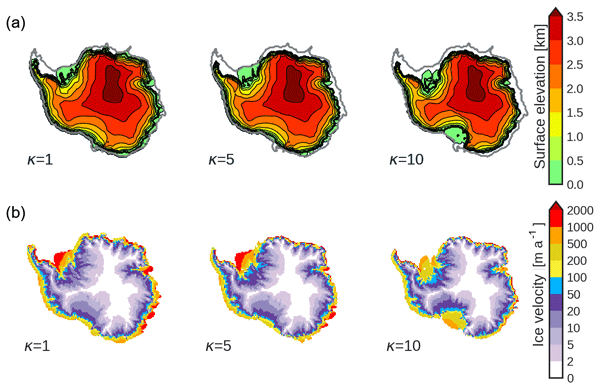 Greuell, W., Genthon, C., and Houghton, J.: Modelling land-ice surface mass balance, Cambridge University Press, 117–168, https://doi.org/10.1017/CBO9780511535659.007, 2004. Hanna, E., Navarro, F. J., Pattyn, F., Domingues, C. M., Fettweis, X., Ivins, E. R., Nicholls, R. J., Ritz, C., Smith, B., Tulaczyk, S., Whitehouse, P. L., and Zwally, H. J.: Ice-sheet mass balance and climate change, Nature, 498, 51–59, https://doi.org/10.1038/nature12238, 2013. 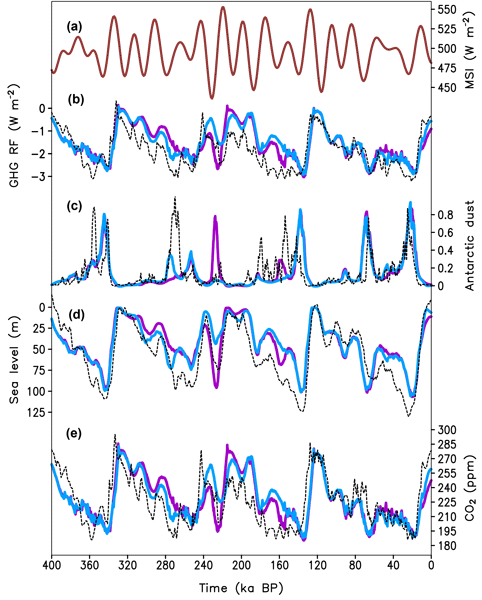 Heinemann, M., Timmermann, A., Elison Timm, O., Saito, F., and Abe-Ouchi, A.: Deglacial ice sheet meltdown: orbital pacemaking and CO2 effects, Clim. Past, 10, 1567–1579, https://doi.org/10.5194/cp-10-1567-2014, 2014. Krapp, M.: Model Code, https://doi.org/10.17605/OSF.IO/5PUX2, last access: 16 May 2017a. Krapp, M.: Model Data, https://doi.org/10.17605/OSF.IO/A3VH2, 16 May 2017b. Krapp, M.: SEMIC: Surface Energy and mass balance model of intermediate complexity, GitHub repository, available at: https://github.com/mkrapp/semic, 2017c. Morin, S., Lejeune, Y., Lesaffre, B., Panel, J.-M., Poncet, D., David, P., and Sudul, M.: An 18-yr long (1993–2011) snow and meteorological dataset from a mid-altitude mountain site (Col de Porte, France, 1325 m alt.) for driving and evaluating snowpack models, Earth Syst. Sci. Data, 4, 13–21, https://doi.org/10.5194/essd-4-13-2012, 2012. Moss, R. H., Edmonds, J. A., Hibbard, K. A., Manning, M. R., Rose, S. K., van Vuuren, D. P., Carter, T. R., Emori, S., Kainuma, M., Kram, T., Meehl, G. A., Mitchell, J. F. B., Nakicenovic, N., Riahi, K., Smith, S. J., Stouffer, R. J., Thomson, A. M., Weyant, J. P., and Wilbanks, T. J.: The next generation of scenarios for climate change research and assessment, Nature, 463, 747–756, https://doi.org/10.1038/nature08823, 2010. Nghiem, S. V., Hall, D. K., Mote, T. L., Tedesco, M., Albert, M. R., Keegan, K., Shuman, C. A., DiGirolamo, N. E., and Neumann, G.: The extreme melt across the Greenland ice sheet in 2012, Geophys. Res. Lett., 39, L20502, https://doi.org/10.1029/2012GL053611, 2012. Oerlemans, J.: The mass balance of the Greenland ice sheet: sensitivity to climate change as revealed by energy-balance modelling, The Holocene, 1, 40–48, https://doi.org/10.1177/095968369100100106, 1991. Oerlemans, J. and Knap, W.: A 1 year record of global radiation and albedo in the ablation zone of Morteratschgletscher, Switzerland, J. Glaciol., 44, 231–238, https://doi.org/10.3198/1998JoG44-147-231-238, 1998. Ohmura, A.: Physical Basis for the Temperature-Based Melt-Index Method, J. Appl. Meteorol., 40, 753–761, https://doi.org/10.1175/1520-0450(2001)040<0753:PBFTTB>2.0.CO;2, 2001. Poli, R., Kennedy, J., and Blackwell, T.: Particle swarm optimization, Swarm Intelligence, 1, 33–57, https://doi.org/10.1007/s11721-007-0002-0, 2007. Reeh, N.: Parameterization of melt rate and surface temperature on the Greenland ice sheet, Polarforschung, 59, 113–128, 1991. Reijmer, C. H., van den Broeke, M. R., Fettweis, X., Ettema, J., and Stap, L. B.: Refreezing on the Greenland ice sheet: a comparison of parameterizations, The Cryosphere, 6, 743–762, https://doi.org/10.5194/tc-6-743-2012, 2012. 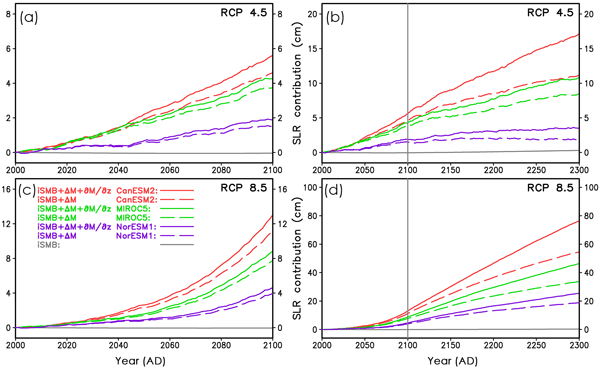 Robinson, A. and Goelzer, H.: The importance of insolation changes for paleo ice sheet modeling, The Cryosphere, 8, 1419–1428, https://doi.org/10.5194/tc-8-1419-2014, 2014. 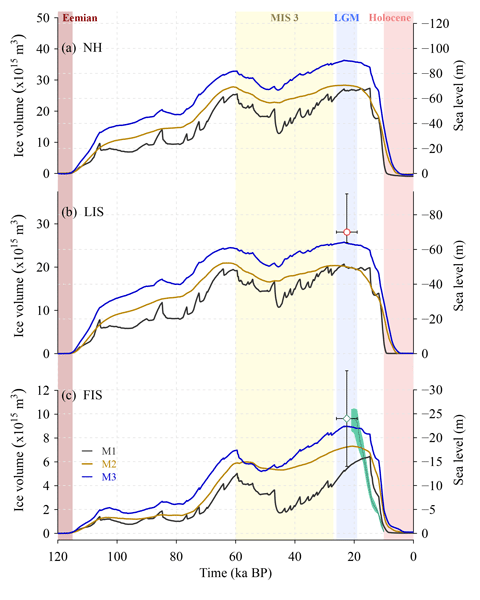 Robinson, A., Calov, R., and Ganopolski, A.: An efficient regional energy-moisture balance model for simulation of the Greenland Ice Sheet response to climate change, The Cryosphere, 4, 129–144, https://doi.org/10.5194/tc-4-129-2010, 2010. Slater, A., Pitman, A., and Desborough, C.: The validation of a snow parameterization designed for use in general circulation models, International J. Climatol., 18, 595–617, https://doi.org/10.1002/(SICI)1097-0088(199805)18:6<595::AID-JOC275>3.0.CO;2-O, 1998. Thomas, R., Frederick, E., Li, J., Krabill, W., Manizade, S., Paden, J., Sonntag, J., Swift, R., and Yungel, J.: Accelerating ice loss from the fastest Greenland and Antarctic glaciers, Geophys. Res. Lett., 38, L10502, https://doi.org/10.1029/2011GL047304, 2011.
van As, D., Fausto, R. S., Cappelen, J., van de Wal, R. S., Braithwaite, R. J., Machguth, H., Charalampidis, C., Box, J. E., Solgaard, A. M., Ahlstrøm, A. P., Haubner, K., Citterio M., and Andersen, S. B.: Placing Greenland ice sheet ablation measurements in a multi-decadal context, Geol. Surv. Denm. Greenl., 35, 71–74, 2016.
van de Berg, W., van den Broeke, M., Ettema, J., van Meijgaard, E., and Kaspar, F.: Significant contribution of insolation to Eemian melting of the Greenland ice sheet, Nat. Geosci., 4, 679–683, https://doi.org/10.1038/ngeo1245, 2011.
van den Broeke, M., Bamber, J., Ettema, J., Rignot, E., Schrama, E., van de Berg, W., van Meijgaard, E., Velicogna, I., and Wouters, B.: Partitioning Recent Greenland Mass Loss, Science, 326, 984–986, https://doi.org/10.1126/science.1178176, 2009.